Relax, this one isn't about religion, I promise. It is about the free and easy way in which some companies, in this instance T-Mobile UK, bandy around the word 'unlimited' to mislead customers. 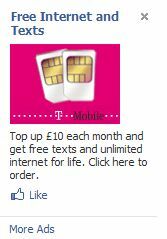 I joined T-Mobile way back in 2009 after seeing the following advert on Facebook. 1 - not limited; unrestricted; unconfined: unlimited trade. 2 - boundless; infinite; vast: the unlimited skies. 3 - without any qualification or exception; unconditional. I would consider that both definitions 1 and 3 would, or at least should, apply to any service touted as being 'unlimited'. Yet they do not, not in T-Mobile's world. I changed home internet provider recently, switching from the fifth ring of Dante's Hell that is TalkTalk, where download speeds often made dial up look respectable, to BT, who aren't without problem but at least I no longer have time to make a cup of tea and take a nap whilst a file downloads. Anyway, I digress. With BT you have access to BT SmartTalk, a rather nifty VoIP app which offers the ability to make calls using your mobile data but it be charged to your home number. A wonderful idea, one I applaud BT for introducing. If only it worked. It doesn't. Why? Because T-Mobile, in their infinite wisdom, seemingly consider that the definition of 'unlimited' should read something like this. As such, T-Mobile see fit to prohibit the use of such software as BT SmartTalk, or indeed Skype, for those of us paying them specifically for UNLIMITED internet. I was advised by their Twitter staff that all Pay As You Go accounts have restrictions and that I could change to a contract which does not place these restrictions. But why should I? Am I not paying £10 a month for unlimited access already? I'm not even a heavy user, but I do expect to have available that which is advertised. I am not in a financial position to sign up to a contract anyway, I'm unable to work due to health reasons and I'm a long-term carer for my elderly mother. Finding £10 a month is sometimes a stretch, being expected to find doubtless considerably more and be tied to a contract is completely unacceptable and, as far as I'm concerned, a breach of my statutory rights under UK legislation. Looking into this situation online I find that Ofcom, the UK's telecommunications regulatory body, introduced a voluntary Code of Practice with regards these restrictions, following a European Commission investigation. Part of this was 'net neutrality', whereby those paying for internet access should receive access to the full range of services available over the open internet, and providers should not use the term 'internet access' for a service that blocks access to lawfully available internet services. Such as BT SmartTalk and Skype. It is telling that T-Mobile was apparently one of only three companies, along with Vodafone and Orange, who refused to become signatories to a code designed to protect customers. T-Mobile might point to their Terms and Conditions, if they're available to read – currently that page is down for maintenance, yet no terms were supplied when I was sent my sim card and no restrictions were stated when I applied for it. This is, of course, academic as any Terms and Conditions that impose restrictions must, logically, negate any legitimate use of the word 'unlimited' when advertising the service. Many other providers in the UK, including budget companies such as GiffGaff, do not restrict users' access to VoIP services. Indeed with GiffGaff I would receive not only 1GB of internet, more than enough for my purposes, and unlimited texts for £10 a month, but I would also receive 250 talk mins and free GG to GG calls! For £2 more than I pay T-Mobile I could also have completely unlimited internet, and all of this without the necessity to tie myself to any contract. On top of this, even their calls are cheaper with calls to landlines or other mobiles being 10p a minute, after you use up your free minutes, not the 25p a minute T-Mobile charge. This might sound like an advert for GiffGaff but it's not, I'm just highlighting the difference between a company offering good value for money and those, like T-Mobile, merrily fleecing customers. So it is not as though T-Mobile is any longer providing a particularly great value product, things have moved on from when I joined, and imposing unfair restrictions merely serves to damn them further. I was of the opinion that T-Mobile were a good company offering a decent service. No longer. I find their restrictions completely unacceptable. You may ask why I don't simply leave T-Mobile for another provider. Fair question, but I am over £100 in bloody credit to these people, money I will lose if I leave, and which was paid to them in good faith that they would supply the service advertised – unlimited internet! That is money I cannot write off and as a matter of principle I would not anyway, as far as I'm concerned it was taken under false pretenses. To add insult to injury, I had to switch to a micro-sim recently. For the privilege of continuing to be ripped off by T-Mobile they had the temerity to charge me £10 to supply one. Next time you're advised to visit your hospital's urology department I suggest going to T-Mobile instead, they are after all experts at taking the piss.